The name Ashtanga Yoga means “8 limbs” in Sanskrit. It is a reference to the 8-part method of practice in the ancient text, the Yoga Sutras of Patanjali. In Patanjali’s method, the practice of asana or postures is one part of a comprehensive discipline of self knowledge and care including physical and mental training. It is considered a traditional practice because it draws on the ancient texts and traditions of India for its inspiration. Ashtanga Yoga is a dynamic method of choreographed sequences of postures linked with breath and concentration techniques that aim to give practical experience of the 8-limbed method. Ashtanga Yoga is taught in two complementary formats, Mysore style or Led classes. We offer a variety of Led classes based in the Ashtanga Yoga system for all levels. Read on for details. Hands on assitsts are a key feature of the Ashtanga Yoga teaching method; they can direct your awareness and support your effort in class. 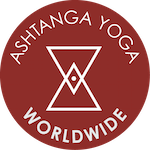 Ashtanga Yoga Worldwide teachers are trained and experienced in giving these hands on assists but we recognize that you may not always want one. We offer consent cards that can be placed on your mat to quietly indicate your preference to receive hands on assists or not. They can be flipped throughout the class to indicate your preference. Feel free to ask for details. Mysore style is a self paced practice where you work in relationship with your teacher. The student will learn the system at his or her own pace with guidance and support. This is the best way to learn Ashtanga Yoga, and the perfect starting point for beginners. Rather than being led through the sequence, you will be aided in memorizing the poses over time, cultivating a consistent practice, and practicing independently. New poses will be added gradually. Your class time will vary depending on your pace and the number of postures you have learned to practice. It is not necessary to stay for the entire scheduled class. All experience levels practice together creating a dynamic and harmonious classroom community, allowing the teacher to support and assist each student when and where they need it. Hallmarks of this style of teaching include hands on assistance, individualized instruction, and silent focus to encourage concentration, inspiration, and perspiration. Full Primary Series. This class is for experienced students, or as a complement to a regular Mysore practice. In this class, the teacher will call out the names of the poses in Sanskrit according to the classical vinyasa count. To encourage your independence and focus, the teacher will not demonstrate or offer modifications, however you are encouraged to modify as needed. This class is for you to work on efficiency in your practice and refine what you have learned in Mysore style classes. The full sequence of poses is meant to be learned gradually. If you haven’t yet learned the full sequence of poses, you can observe what is to come or simply stop at the point where you have learned and finish on your own. Visitors can join this class if you have an established Ashtanga Yoga practice. Ashtanga Flow. This 1 hr. class draws on the poses from the 1/2 primary series classes, leaving off some of the more complex poses. This class is perfect for fit beginners, or those who want to get their practice done in a more condensed timeframe. The teacher will demonstrate poses and offer modifications as necessary. The teacher will take time to demonstrate or explain the technique for entering poses as necessary. Restorative Yoga. As a practice done primarily on the floor with the use of props, Restorative is a form of gentle yoga with passive restorative postures to open the body, quiet the mind and move into a deep sense of relaxation. A meditative time to cultivate awareness of body, breath, and mind, this class is recommended for those experiencing stress, recovering from injury or illness, and anyone seeking a gentle class to unwind, relax and renew. Tranquil Tuesdays. Witness the enhanced mental clarity, deeper concentration, and renewed focus in life with this weekly class comprised of Meditation and Restorative Yoga. Are you stressed, overwhelmed, or fatigued? Heard about the benefits of meditation but do not know how to start? Join us for this weekly class to learn simple techniques to get you started! Learn guidelines for creating a daily practice and common obstacles for beginners to overcome. Experience the stillness and freedom that is your true nature! Yin Yoga. Yin Yoga is a slow-paced style of yoga done primarily on the floor with postures that are held for longer periods of time – ranging from 45 seconds to five minutes or more. Yin yoga poses target the body’s connective tissues — the tendons, fascia, and ligaments—with the aim of increasing circulation in the joints and improving flexibility. We encourage you to relax your body and breathe to allow gravity to assist you in the stretches. run through the connective tissues. Yin Yoga is also a meditative practice encouraging the awareness of inner stillness and introspection. The practice is a beautiful way to let go of the stress and tension of your day. (and other physical endeavors) that emphasize internal heat.